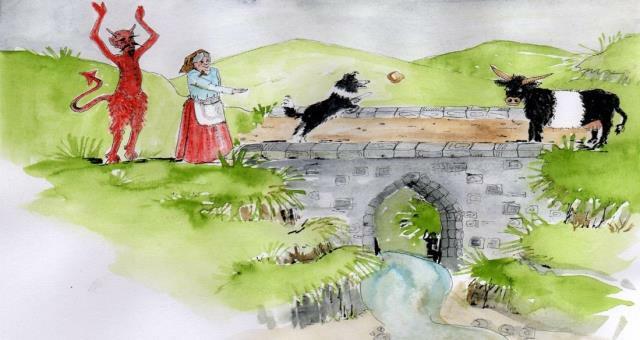 The Legend of Devils Bridge at Devil's Bridge Waterfalls & Nature Trail01970 890233work Famous Person or GhostOne day in the olden times, old Megan of Llandunach stood by the side of the river Mynach feeling very sorry for herself. The Mynach was in flood, and roared down the wooded dingle in five successive falls. Just below where Megan was standing there was a great cauldron in which the water whirled, boiled and hissed as if troubled by some evil spirit. Now Megans' concern was for her one and only cow which was on the wrong side of the ravine. How the wrong headed animal had got there Megan could not guess, and still less did she know how to get it back. "What is the matter Megan?" said a voice behind her. She turned round and saw a man cowled like a monk. She had not heard anyone coming, but the noise of the waters boiling over and through the rocks, she reflected, might easily have drowned the sound of any footsteps. "I am ruined," said Megan. "There is my one and only cow, the sole support of my old age, on the other side of the river, and I don't know how to get her back again. Oh dear, dear, I am ruined." "Don't you worry," said the monk. "I'll get her back for you. It is one of my amusements to build bridges, and if you like, I'll throw a bridge across this chasm for you." "Well indeed," said the old woman, "nothing would please me better. But how am I to pay you? I am sure you will want a great deal for a job like this." "I am very easily satisfied," said the monk. "Just let me have the first living creature that crosses the bridge after I have finished it, and I shall be content." Megan agreed to this and the monk told her to return to her cottage and wait there until he should call for her. Now, Megan was not half such a fool as she looked, and she had noticed, while talking to the kind and obliging stranger, there was something rather peculiar about his foot. She had a suspicion, too, that his knees were behind instead of being in front, and while she was waiting to be summoned, she thought so hard that it made her head ache. By the time she was halloed for, she had hit upon a plan. She threw some crusts to her little dog to make him follow her, and took a loaf of bread under her shawl to the riverside. "There's a bridge for you," said the monk, pointing proudly to a fine span bestriding the yawning chasm. "Hmm, yes," said Megan, looking doubtfully at it. "Yes, it is a bridge. But is it strong?" "Strong?" said the builder, indignantly. "Of course it is strong." "Will it hold the weight of this loaf?" asked Megan, bringing the bread out from underneath her shawl. The monk laughed scornfully, "Hold the weight of this loaf? Throw it on and see. Ha, ha." So Megan rolled the loaf right accross the bridge, and the little black cur scampered after it. "Yes, it will do," said Megan. 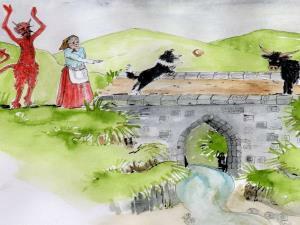 "And, kind sir, my little dog is the first live creature to cross the bridge. You are welcome to him, and I thank you very much for all the trouble you have taken." "Tut, the silly dog is no good to me!" seethed the stranger, and with that he vanished into thin air! From the smell of brimstone which he had left behind him, Megan knew that, as she had suspected, it was the Devil whom she had outwitted! One day in the olden times, old Megan of Llandunach stood by the side of the river Mynach feeling very sorry for herself. The Mynach was in flood, and roared down the wooded dingle in five successive falls. Just below where Megan was standing there was a great cauldron in which the water whirled, boiled and hissed as if troubled by some evil spirit.